An academic conference organized by Al-Haq, in partnership with Birzeit University Institute of Law, the Palestinian Centre for Human Rights (PCHR) and the International Federation for Human Rights (FIDH) was held on 3-4 October 2018. 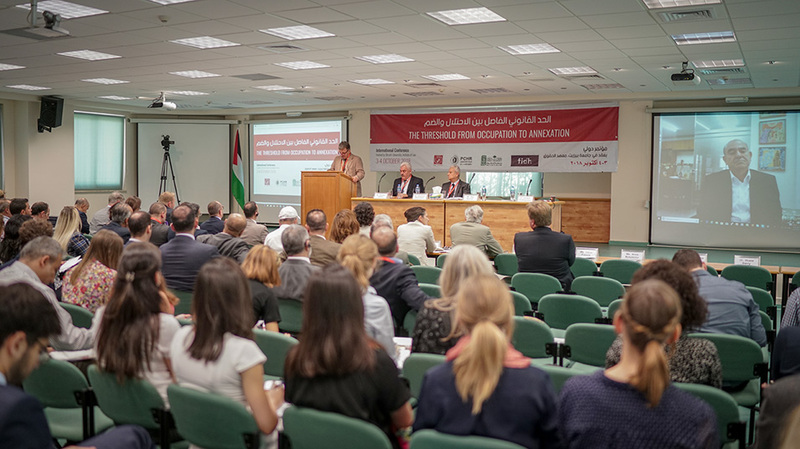 Entitled “The Threshold from Occupation to Annexation,” the conference hosted international and Palestinian academics and experts in international law. 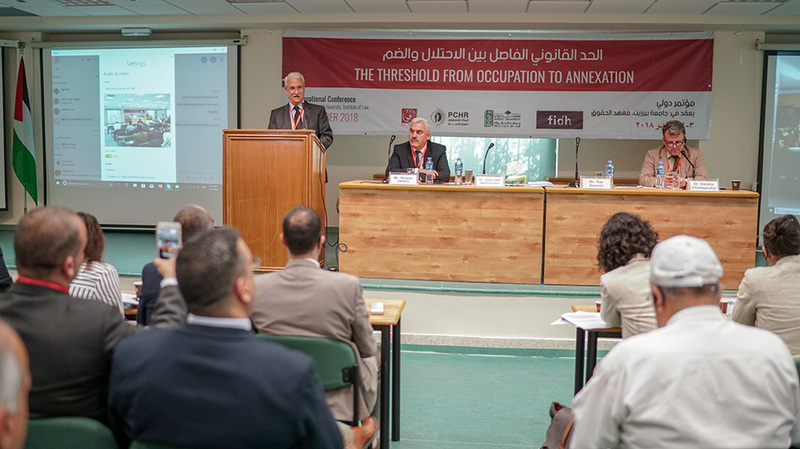 The two-day conference, hosted by Birzeit University, aimed to examine whether a threshold exists at which point a belligerent occupation becomes unlawful annexation. Sessions throughout the conference specifically examined the case of prolonged military occupation that exceeds the legal parameters of occupation as a temporary situation, becomes illegal, and is instead a form of prohibited annexation and colonialism. The welcome remarks made by the organisers, Dr. Abdullatif Abuhijleh, President of Birzeit University, Mr. Shawan Jabarin, General Director of Al-Haq, Dr. Dimitris Christopoulos, President of the FIDH, and Mr. Raji Sourani, Director of PCHR, stressed the importance of legal research and analysis toward a deeper understanding of the nature of the Israeli military occupation and the need for action on the necessary measures to end it in order to protect Palestinian rights. Meanwhile, the keynote address was given by Professor Michael Lynk, UN Special Rapporteur on the situation of human rights in the Palestinian Territory occupied since 1967, speaking in his personal capacity as a scholar and Associate Professor of Law at Western University in London, Ontario. In his paper, Professor Lynk argues that Israel has crossed the legal tipping point of the four-part test, derived from the leading principles of the law of occupation, to assess whether an occupying power is administering the occupation in line with international law and the laws of occupation, rendering it illegal. Mr. Lynk further called for the international community to deepen steps of non-recognition and take accountability measures, such as conditions and sanctions against the Occupying Power in the Occupied Palestinian Territory (OPT). In the first session, entitled “Israel’s Prolonged Occupation of the Palestinian Territory: Relevance of International Humanitarian and Human Rights Law,” moderated by Ms. Nadia Hardman, Manager of the Diakonia IHL Resource Centre in Jerusalem, Ms. Janique Thoele, Legal Advisor to the Office of the High Commissioner for Human Rights in Palestine, emphasised the importance of the protection afforded to the civilian population under occupation through the international law applicable in the Palestinian territory. She noted, however, that there are still gaps and obstacles to the full protection of the civilian population in the Palestinian context. With a paper entitled “Is the Occupation Legal Framework Still Relevant in Palestine Today?” Professor Ray Murphy, of the Irish Centre for Human Rights, highlighted the importance of adherence to international humanitarian law as a regulatory framework for the situation of occupation in the Palestinian territory, regardless of developments on the ground. Dr. Giulia Pinzauti, Assistant Professor of Public International Law, Grotius Centre for International Legal Studies, Leiden Law School, presented a paper entitled “Belligerent Occupation or Creeping Annexation? Identifying the Red Flags” in which she analysed data from several instances of occupation in order to identify red flags indicating creeping annexation in the absence of a formal declaration by an occupying power, including but not limited to the imposition of law, alteration of borders, transfer of civilians to and from the occupied territory, and irreversible facts on the ground. The second session, “From Occupation to Annexation: Towards a Theory of ‘Unlawful’ or ‘Illegal’ Occupant?” was moderated by Dr. Munir Nuseibah, Assistant Professor of Law at Al-Quds University and Director of the Community Action Center. Dr. Vito Todeschini, Associate Legal Adviser for the International Commission of Jurists, presented a paper entitled “Between Prolonged Occupation and Annexation: Questions on the Characterization of the West Bank as Annexed Territory”, in which he drew attention to the fact that international humanitarian law does not address long-term occupation. He further outlined the legal and practical implications of moving towards a discourse of annexation, when the occupation itself involves violations of international law. In the same session, Ms. Sahar Francis, General Director of Addameer Prisoner Support and Human Rights Association, presented a paper on the role of military courts of the Occupying Power in annexation, stating that the military orders over the past 50 years do not protect the rights of the occupied people, but support the aims of the occupier. Professor Ardi Imseis, Assistant Professor of Law, Faculty of Law, Queen’s University, then presented his paper, “International Law and Prolonged Military Occupation: The Case of Palestine 1967-2018” in which he argued that the military occupation of the OPT is illegal based on the analysis that the Occupying Power, Israel, has violated peremptory norms, including the denial of the exercise of the right to self-determination, the inadmissibility of acquisition of territory under occupation, and the general prohibition on the impositions of regimes that are inimical to humankind. The final session of the first day of the conference, “Annexing the Palestinian Territory: The Responsibility of Third States” was moderated by Dr. Mustafa Mari, Professor of Human Rights at Birzeit University. The panel included Dr. Susan Power, Head of Legal Research and International Advocacy at Al-Haq, who presented her paper, “Between Occupation and Annexation: Charting Debellation in Palestine”. Dr. Power highlighted the actions of the Occupying Power which are hallmarks of creeping annexation and could directly cause the failure of the occupied state, leading to debellation. She further examined the position of Palestine under this planned debellation towards Bantustan style enclaves and potential destruction of the possibility of a state. A paper entitled, “Scope of State Obligations to Respect and to Ensure Respect for the Geneva Conventions in the Context of Citizenship Problems Faced by the Residents of Occupied Territories” was presented by Ms. Anna Mykytenko, a Legal Associate from Global Rights Compliance. Ms. Mykytenko outlined the obligations of the High Contracting Parties in accordance with common Article 1 of the Geneva Conventions, in particular with regard to the protection of citizenship rights. Lastly, Ms. Katherine Gallagher, Senior Staff Attorney for the Center for Constitutional Rights presented her paper, “The United States as Enabler of Annexation: Consideration of Third State Responsibility in the Case of Jerusalem”. Ms. Gallagher detailed the role of the United States in the political, economic, and social empowerment of the Israeli occupation and the entrenchment of its control over the OPT and its people. The second and final day of the conference began with a panel entitled, “Annexing Resources: Pillage, Corporate Complicity, and Economic Incentives Prolonging Israel’s Occupation” moderated by Mr. Raja Khalidi, the Research Coordinator for the Palestine Economic Policy Research Institute (MAS). Dr. Shane Darcy, Senior Lecturer for the Irish Centre for Human Rights, National University of Ireland Galway presented his paper, “Corporations, Conflict and Complicity: The Role of Business and Human Rights”. In his presentation Dr. Darcy explored the developing business and human rights framework and its relevance for the situation in Palestine, drawing from the experience in South Africa where attempts were made to hold companies accountable for their complicity in the system of apartheid. Mr. Munshi Zubaer Haque, Deputy Editor of the Indian Journal of Law and International Affairs, then gave a presentation of his paper, “The Paris Protocol: Examining the Prospects and Challenges of Trade and Economic Cooperation between Palestine and the ‘Occupation’”. Mr. Zubaer Haque gave an analysis of the prospects and challenges of the economic cooperation in the framework established by Paris Protocol and the occupying power’s willingness to abide by the agreement. At the end of the session, Dr. Valentina Azarova, a Visiting Academic at Manchester International Law Centre and Legal Advisor to the Global Legal Action Network (GLAN), presented her paper, “Illicit Financial Flows: The Obligation of Third States Not to Recognise the Proceeds of Certain Economic Activities in Occupied Territory”. Dr. Azarova’s paper argues that breaches of the duty of non-recognition are a form of complicity in the maintenance of an objectively illegal situation and a mode of liability in international law. Thus, third parties have an obligation not to recognize certain economic activities located in Israeli settlements in the OPT. The following session covered the topic, “Annexing the Palestinian People: Prospects for Self-determination and Return of Palestinian Refugees” and was moderated by Ms. Lubnah Al-Shomali from BADIL Resource Center for Palestinian Residency and Refugee Rights. Mr. Hassan Jabareen, Founder and General Director of Adalah – The Legal Center for Arab Minority Rights in Israel presented his paper, “The Jewish Nation-State Law and the Question of Annexation”, in which he emphasized that the most relevant discourse is that Israel exercises on legal regime in all of the territories it controls based on the superiority of one ethnic group over the other, in contradiction of international norms. In her presentation, “Annexation of Lands, Colonization of Lives: Perspectives for Palestinian Refugees in the West Bank”, Ms. Francesca Albanese, Affiliate Researcher at the Institute for the Study of International Migration at Georgetown University, highlighted the legal and political implications and consequences that annexation may have on refugees, their status, rights, treatment, and living conditions. Lastly, Mr. Thomas Hammarberg, a Human Rights Advisor and former Human Rights Commissioner for the Council of Europe, presented his paper, “Justice Postponed: The Case of Palestinian Refugees”. Mr. Hammarberg asserted that the Palestinian refugee issue is a central issue to peace effort, and not a side issue or final status issue. He argued that immediate and effective measures must be taken to address ongoing humanitarian issues, including securing necessary funding for UNRWA programming, in order to avoid dangerous political consequences. The final panel session “Beyond Occupation: Apartheid and Colonialism in Palestine” was moderated by Mr. Mohammad Zeidan, General Director of the Arab Association for Human Rights. Dr. Ralph Wilde, Reader in the Faculty of Laws at University College London presented his paper, “Challenging the Occupation through Challenging Occupation Law: Why Human Rights Law is Preferable to Occupation Law”. Dr. Wilde argued that there is a need to move beyond occupation law in order to challenge the existence of the occupation itself as violations of the right to self-determination. Dr. John Reynolds, of National University of Ireland, Maynooth then presented his paper, “Beyond Occupation and Annexation: The Significance of Apartheid in International Legal Discourse on Palestine”. Dr. Reynolds emphasised that apartheid is an applicable framework in the context of Palestine as a structural regime that has been firmly established as prohibited under international law. Lastly, Dr. Rimona Afana, a Visiting Scholar with the Vulnerability and the Human Condition Initiative at Emory University School of Law, presented her paper, “The Occupation-Colonialism Nexus: Theoretical and Empirical Evidence of its Relevance to Transitional Justice in Palestine/Israel”. Dr. Afana gave evidence that the occupation of Palestine diverges from other belligerent occupations and should therefore be treated as unlawful. The closing session of the conference titled “Bringing Israel’s Prolonged Occupation of the Palestinian Territory to an End: Challenges and Prospects” was moderated by Dr. Asem Khalil, Director of the Institute of Law at Birzeit University. Dr. Norman Finkelstein, of Princeton University addressed central theme of the conference in his remarks, “If an Occupying Power Fails to Negotiate “In Good Faith,” the Occupation is Illegal: The Namibia Precedent and Palestine”. Dr. Emilio Dabed, Associate Researcher in the Faculty of Law at An-Najah National University concluded with a presentation of his paper, “Palestinian Legal Activism: Between Liberation and the ‘Desire’ of Statehood”. Dr. Dabed advised legal activists and other experts to remain cognisant of the limits of international law in emancipatory struggles.